Birthdays are awesome! I celebrated mine yesterday and it was just so much fun catching up with friends and family. I thought I’d share the fun with you all and hold another giveaway here! I know I still haven’t announced the winners of the previous giveaway, but don’t worry I’ll be contacting them today. So what’s the giveaway for? 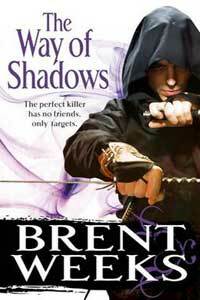 One lucky reader will receive a copy of The Way of Shadows by Brent Weeks. I just read the entire series and it’s great. To enter the giveaway, leave a comment behind with your favourite birthday memory. You’ll also get a second entry if you’re following me on Twitter and tweet about this giveaway with the hashtag #missgeeky. The competition is open to everyone and it will end on March 3rd after which I’ll randomly draw a winner.